​Arsenal opened up a two-point lead over challengers Manchester City in the first Women's Super League action of the New Year, capitalising after the latter failed to win their opening game of 2019. Having been beaten by City in their last league outing before the Christmas break - their first dropped points of the season after a flying start - Arsenal returned to winning ways with a 4-2 victory over West Ham. It wasn't easy as two Jane Ross goals for the Hammers ensured the game was tied 2-2 at half-time, but Danielle van de Donk scored a brace after the interval. The Gunners now regain the advantage in their quest for a first WSL title since 2012. 2016 champions Manchester City, meanwhile, were pegged back by Bristol City. 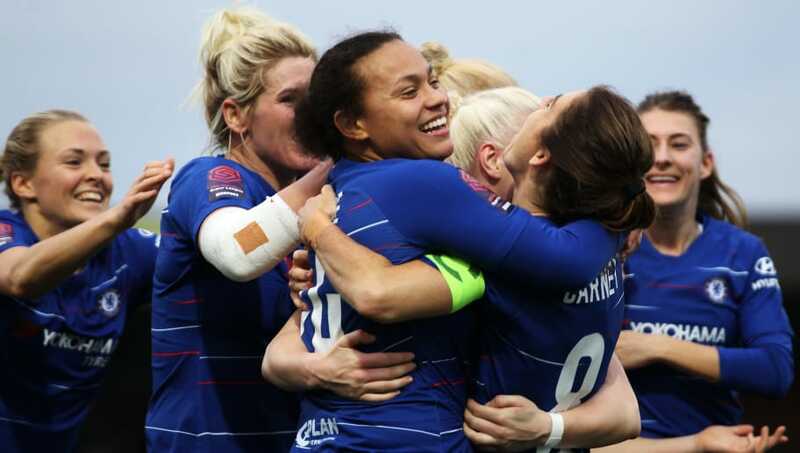 Nikita Parris scored her 11th WSL goal of the season to give the northern visitors the lead, only for a 61st minute penalty from Lucy Graham to pull Bristol back level. And that was the way it stayed, as the game ended 1-1. Chelsea continued their fine run of form by beating lowly Everton. Beth England's early goal got the reigning champions off to the perfect start, with further strikes from Drew Spence and Hannah Blundell in the second half completing a comfortable 3-0 win. ​Chelsea are now third, just three points behind City and five points off leaders Arsenal. They are due to face ​Arsenal next week in a game that could have huge ramifications in the title race. Elsewhere, fourth place Birmingham continue to keep pace with the big guns after securing a late 2-1 win against Reading. The opening goal from Kerys Harrop didn't come until the 78th minute, while it looked like Remi Allen had rescued a point for the Royals with a late equaliser. Meaghan Sargeant scored an even later winner to keep the Blues level with Chelsea. A dreadful run of form continued for Liverpool as they were beaten at home by Brighton, who were able to ease their relegation fears as result. Laura Rafferty and Ini Umotong scored Brighton's goals either side of half-time in the 2-0 victory. ​Liverpool are now win-less in the league since October. The promotion race in the second tier Women's Championship remains incredibly tight, although ​Manchester United blasted off any New Year cobwebs by winning 9-0 against London Bees and opening up a one-point gap at the top of the table. ​Tottenham are second after a narrow 2-1 away in over Sheffield United, while Durham and Charlton have marginally slipped back after drawing 2-2 with each other.